Many of you know me from managing REVERB’s volunteer program, but did you know that I also manage our internship program?! That’s right – each summer we invite three amazingly talented college students (or recent graduates) to join us in our Portland, Maine headquarters to learn about the inner-workings of REVERB. We also look for one intern to join us each fall and spring. Interns help us make phone calls, do research, take on fun projects, and best of all – work onsite at many shows! Below is detailed information about the program and how to apply. If this opportunity would be a good fit for you or someone you know, we’d love to hear from you! REVERB is seeking unpaid interns to assist with office and local music venue based work in Portland, Maine. Currently accepting applications for 2019. We seek energetic, hard working interns to assist us in our daily operations in our Portland, Maine office and onsite at local music venues. Interns will gain experience in a fast-paced office environment and learn about the inner workings of a small environmental non-profit organization and the music industry. Our interns will have the opportunity to connect with our partner organizations, volunteers and fans through our work online and onsite at hundreds of shows each year. 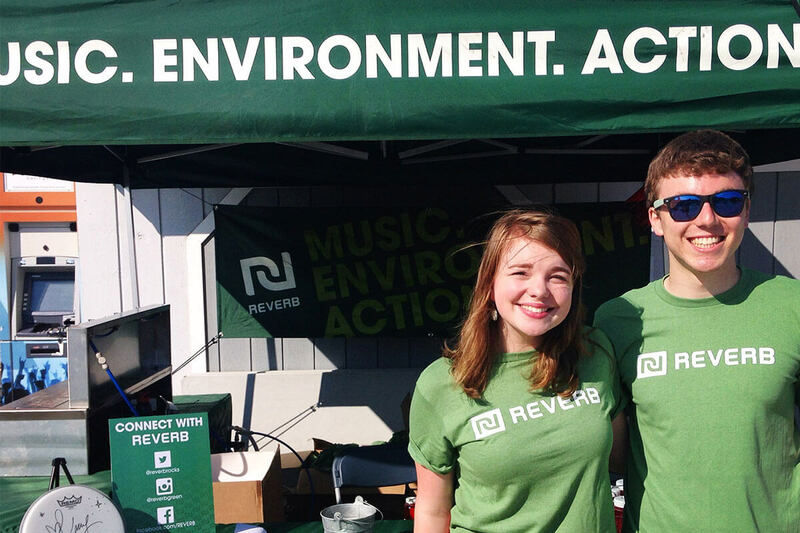 Interns attend New England-area concerts to understand how REVERB’s work is executed onsite. Applications are accepted on a rolling basis. Please, no phone calls. Thanks! Interns are assigned to an in-house Mac machine.